After the weekend bonanza of double-headers in the Indian Premier League 2019 (IPL 2019). It is back to a single match! All the teams have played three matches thus far and things in the tournament has started to heat up. Defending champions Chennai Super Kings (CSK) is the only unbeaten team so far while rest of the teams have tasted a defeat or two. Meanwhile, as the T20 league sets its foot into another week, here’s look at today IPL 2019 schedule. IPL 2019 Schedule in PDF: Download VIVO Indian Premier League 12 Full Timetable With Fixtures, Matches, Team and Venue Details. With three back to back wins, Super Kings lead the IPL 2019 points table. Last year’s runners-up Sunrisers Hyderabad (SRH) take the second spot with two wins out of three matches. Kolkata Knight Riders (KKR) and Delhi Capitals (DC) complete the top four. Rajasthan Royals (RR) and Royal Challengers Bangalore (RR) are yet to win a game and are placed seventh and eighth respectively on the IPL 2019 points table. Kings XI Punjab (KXIP) and Mumbai Indians (MI) are on fifth and sixth spot respectively. IPL 2019 Points Table Updated: CSK Jumps to Number 1, RR Languish at Bottom of the Indian Premier League 12 Team Standings. Virat Kohli-led RCB had to face another humiliating defeat in the IPL 2019. Set a daunting target of 232 runs, RCB were bundled out for 113 runs and thus were handed 118-run defeat. David Warner and Jonny Bairstow scored centuries each and shared a record highest partnership of 185 runs for the first wicket. SRH vs RCB, Stat Highlights: David Warner and Jonny Bairstow Register Highest Opening Partnership in IPL as Sunrisers Win by 118 Runs. In a closely fought contest, Super Kings emerged victorious by eight runs. Royals failed to score 12 off last over, bowled by Dwayne Bravo, to slump to third consecutive defeat in the IPL 2019. MS Dhoni was top-scorer for CSK with unbeaten 75 off 46 balls. CSK vs RR Stat Highlights IPL 2019: MS Dhoni, Bowlers Hand Chennai Super Kings Third Consecutive Win. 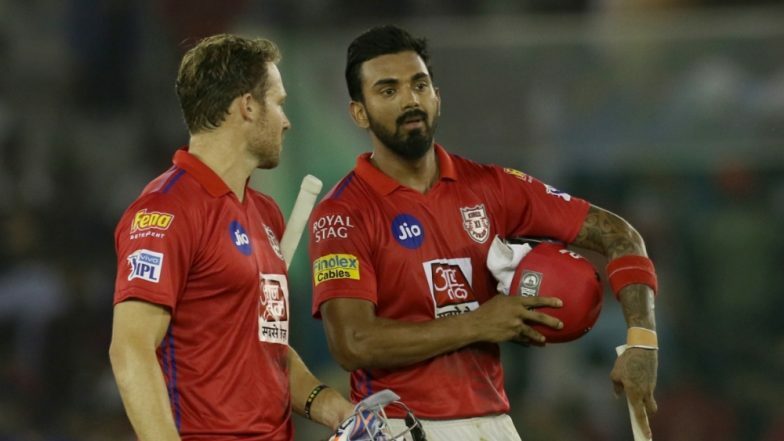 Kings XI Punjab and Delhi Capitals face-off in the IPL 2019 match 13. It will be played at KXIP’s home venue- Punjab Cricket Association IS Bindra Stadium in Mohali. The KXIP vs DC is scheduled to begin at 08:00 p.m (IST). Fans can watch the IPL match two both on TV and via online streaming. Star Sports holds the telecast rights of IPL 2019 and will broadcast the match live across its network. The live streaming online of IPL 2019 will be available on Hotstar app and website. Fans can click here, for KXIP vs DC live score updates.